What happens when a job for life becomes a job for a day? Is the gig economy a fleeting fad or an enduring legacy? The gig economy has been getting a lot of press, positive and negative. But how will it impact employers, employees and society? The “gig” economy is one of the most talked-about trends of the post-financial crisis era. The term refers to an environment in which contingent positions (or temporary work) are common, and organizations – and individuals – regularly contract independent workers for short-term engagements. “Essentially, a gigger is a new and dynamic word for a contingent worker,” says Tony Steadman, Total Talent Supply Chain, EY. It’s currently receiving most of its media coverage in relation to transport, food delivery and odd jobs. But after first being used to source short-term contracts with highly skilled individuals by the oil and gas sector, among others, in the 1980s, gig work is also mushrooming at the high-skilled end of the market – connecting coders, programmers or graphic designers, among many other professions, to companies both large and small. Since the financial crisis, gigging has also been a growing trend in sectors like technology, telecoms, and financial and professional services. In the last decade, powered by the latest technological innovations and the prevalence of mobile technology, new business models have emerged, opening up new opportunities to directly match independent workers with their customers. The rise of the gig economy has been a big enough trend that businesses and politicians alike are taking note and trying to work out how to respond. In June 2017 the European Parliament adopted a draft report calling for fresh EU-wide legislation to ensure greater protection for workers in the gig economy. The UK government’s independent report, Employment Practices in the Modern Economy, was published in July 2017 with significant focus on the gig economy, focused around a number of key areas. Of those the most prominent were the impact of gigging on employee rights and long-term welfare, and the responsibilities of employers, employees and the state to maximize the benefits of this shift in ways of working. Other legislators around the world are following suit. Today, “the numbers are growing rapidly, and workforce data trends suggest the gig economy will continue to grow over the coming years, potentially becoming the majority of the workforce in many companies in the near future,” says David Storey, EY Global People Advisory Services Talent Leader. There’s always been a gig economy – so what’s new? Prior to the Industrial Revolution, many people were “giggers” of one kind or another – from artisans and craftsmen to seasonal agricultural workers. They responded to specific, time-bound opportunities as potential employers’ needs arose. Over the 20th century, the factory system – and then the “firm” – emerged as the central engine of modern economies, creating millions of full-time blue- and white-collar jobs with set hours, rights and benefits. This system fitted the industrial age. Prior to the Internet era, an assembly-line operation, whether in manual or knowledge work, was the most efficient way of working. The income stability this massive expansion in full-time salaried employment brought contributed to a rapid improvement in living standards in most industrialized countries. But over the last 20 years, this model has begun to change. First, there is far less job security today than in the golden years of twentieth century capitalism. Organizations have needed to become more flexible, so the notion of a job for life has ceased to be the norm. The financial crisis deepened this trend, as many companies downsized, or limited their headcount expansion. Analysis by EY shows that, among S&P 500 organizations, annual full-time employee headcount growth dropped to 2.7% from 2009 to 2015, versus 3.9% during the five years prior to the recession. Many well-educated young people leaving university post-2009 struggled to find jobs. This has led to an increase in self-employment, freelancing and contingent work as more people seek to earn a living from multiple sources, or without a full-time job. 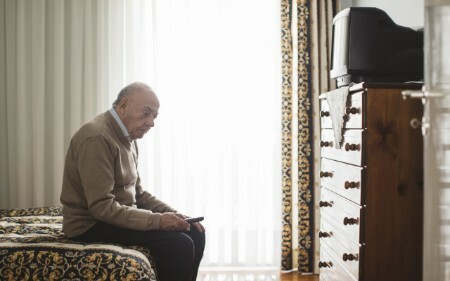 While such a move towards intermittent work and odd-jobbing has happened before when full-time work has been scarce, in recent years the process has been turbo-charged by parallel developments in web connectivity, apps, smartphones, GPS and increasingly sophisticated algorithms. All of these have combined to enable a more sophisticated level of matching between organizations and workers than ever before. The technological potential for the gig economy was born just as the need for it emerged. Lifestyle benefits and career progression are clear benefits. Gigging, freelancing and self-employment have many appealing lifestyle benefits, especially for younger people and higher skilled workers. One key positive for gig workers is the increased flexibility to fit one’s work in accordance with different life stages and other commitments (even other jobs), with 80% of respondents to EY’s survey listing this as a key benefit. With flexible working increasingly in demand by workers – but often hard for traditional employers to facilitate – gigging gives workers the ability to choose when, where, and what to do more than a classic 9 to 5 job has ever allowed, with 49% listing the sense of control gigging provides as a major benefit. Asset-light Millennials and Gen-Zers, in particular, increasingly have the portable digital skills, and mobility, to bypass entry-level jobs and tap out code in one of the many “digital nomad” hubs emerging around the world. This nomadic working lifestyle has been helped along by the rise of low-cost, flexible connected workspaces. Other lifestyle benefits of gigging include flexibility for those with children or elderly relatives, or other care-giving responsibilities, with 33% enjoying the ability to work from home. Those in the lower-paid end of the gig spectrum – like logistics, transport and delivery – can top up their salaries, seek new sources of income, or even pick up new skills and experience through gigging to facilitate a change of career. Indeed, more than half of giggers surveyed by EY saw contingent working as a way to advance their careers, with a clear majority preferring contingent work to full-time employment. Traditional long-term moves are declining in favor of a variety of business travel approaches and mobility options that better fit organizational strategy and employee needs. Supported through a frictionless, consumer-level experience, these approaches can boost compliance and speed to deployment. A choice born of necessity? There are, however, also many “reluctant” giggers, who take on short-term jobs because there aren’t any full-time jobs for them. OECD data shows self-employment is higher in poorer countries like Colombia, Greece and Turkey, compared to wealthier nations like Luxembourg, Norway and – surprisingly, for a country that prides itself on entrepreneurship – the US. But the gig economy does, at least, give greater access to employment opportunities in these developing markets. Speed to market and competitive innovation are benefits for companies. Giggers offer many benefits for organizations of all sizes. They can help companies respond nimbly to time-bound assignments, which they might lack skills for in-house. Contingent workers can also help companies transition into new areas so they keep up with their competitors. This is particularly the case in the digital era, when skills in areas like cyber security, social media technology and digital marketing may not be embedded in an organization and contingent workers can help smooth the transition by bringing new skills and knowledge. Because of this combination of factors, according to EY’s survey, 50 percent of organizations increased their use of contingent workers over the last five years. By 2020, EY forecasts show, almost one in five US workers will be contingent — the equivalent of 31 million people. If part-time workers are included in the definition of “alternative work arrangements,” as much as 50% of the workforce could be in non-permanent employment by 2020. Businesses will need to consider regulation, IP risks and corporate culture. It is not always easy to draw the line between a contingent worker and someone who is, in effect, a de facto full-time worker without the full range of rights and obligations of a regular employee. This means regulators are increasingly scrutinizing the gig economy and initiating reviews – such as the UK’s 2016 Taylor review – to ensure regulations are keeping pace with new realities, and to ensure that employment laws and taxes take this new situation properly into account. As regulations continue to shift from jurisdiction to jurisdiction, employing gig workers could be about to get a lot more complicated. One characteristic of successful companies is a strong internal culture and organizational purpose. When workers feel they are part an organization with a purpose, they are more likely to dig deep and push themselves, and be more creative and innovative. Giggers, not being part of the organization, are less likely to tune into, or harness, that highly motivating internal culture. Data shows they may give less of themselves, especially if they work for different clients and have no particular connection to any of them. EY’s survey found that 65% of contingent workers “would work differently” if they were permanent employees, and 25% would “go the extra mile.” It also found that 26% of contingent workers were “ambivalent or disconnected to” their employer’s business objectives – while 40% of contingent workers feel like outsiders compared to permanent workers. 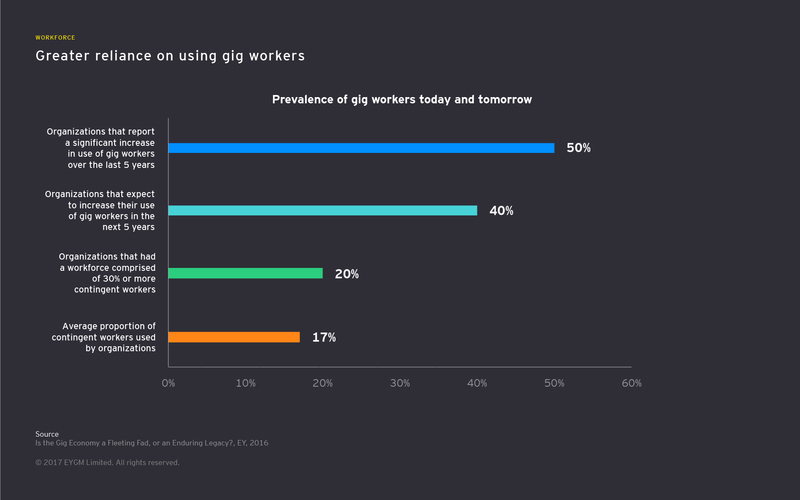 As an enabler of new business models, the expansion of the gig economy forms part of a disruptive threat to some industries. The car industry, in particular, is being profoundly affected by the rise of ride-sharing, which is contributing to falling car ownership in many major cities. How companies recruit, engage with and pay giggers appears fragmented in a sizeable number of organizations. EY’s survey found that 37% of companies had such fragmentation when managing their contingent workforce, with over 30% using multiple vendor platforms and 55% of contingent workers not undergoing any on-boarding process. This lack of coherent governance creates risks. In large organizations, departments could be paying different rates for similar work, causing them to cannibalize on the talent pool if giggers choose one section of the organization over another. This is particularly the case in skills areas that are multi-departmental such as web development or digital technology. Giggers can get valuable access to a companies’ operations, such as its product and service pipeline, long-term strategy, or intellectual property. Companies lack control of what giggers might do with such insights. Organizations that fail to take proper due diligence, such as signing nondisclosure agreements, and potentially even background checks, expose themselves to greater levels of risk. Wages, tax revenues and pensions will be affected. While giggers might be the envy of those stuck in desk-bound office jobs, there are downsides and risks for them too. They have no income stability. No company-sponsored health insurance. No company pension contributions. It is also harder to gain a mortgage and even a lease on a rental property as a self-employed individual, which – given high house prices in a number of Western economies – is a particular concern for younger people choosing to freelance. As gig work platforms and “noticeboards” grow, there is often a race to the bottom as more people rush to join the gig economy, bidding down prices. Many lower-skilled gigs pay low rates, and Western workers may find themselves undercut by cheaper competitors for example in India, in the area of “knowledge piece-work,” which is frequently done remotely, over the web. For governments, gigging is also a risk, as self-employed workers are harder to monitor than those on corporate payrolls. The gig economy could, as a result, lead to a fall in taxes – through deliberate avoidance, reporting errors by individuals unfamiliar with tax returns, and through the loss of employer tax contributions. The UK government, for instance, could lose £3.5 billion in tax revenues by 2020 as a result of the rise in self-employed gig workers, due to the absence of employer-contributed tax. This, in turn, will impact government revenues and increase challenges around funding public services for society as a whole. The rise of giggers may also aggravate the pension crisis in ageing Western economies. One of the reasons for the rise of mandatory employer pension contributions in many countries is the fact that people often underestimate how much they need to save for retirement and fail to pay into pension systems when it is on a voluntary basis. It is thus likely that freelancers could fail to put aside enough money for their old age – putting a significant burden on the state and society down the line. How can we leverage the benefits, and mitigate the risks, of the gig economy? Individuals, companies, governments and regulators all have a role to play. Be realistic: Do not romanticize the gig economy. No sick leave, no perks like health insurance, no company pension contribution and difficulties getting a mortgage – all this will affect those on lower incomes, and those who are younger and have, accordingly, less developed skill-sets, smaller professional networks, and lower savings to tide them over during fallow periods. Plan ahead: As a gigger, the responsibility for your future finances, pension, health care and career development rests firmly on you, not your (temporary) employers. To prosper, individuals must, ironically, be like companies and develop a diversified client base and decent cash reserves. Encourage giggers to engage: As the share of your contingent workforce grows, it will start to have a significant impact on your corporate culture, and strategies will need to be developed to manage that. Try to bring giggers into the organization, develop personal relationships with your teams and cultivate the relationship beyond the merely transactional to help them contribute to, and get motivation from, your organization’s purpose. Focus on governance to minimize risk: Large organizations should ensure consistent ‘gigger governance’ such as on rates, onboarding processes and due diligence. “Not many companies are thinking about this in a systematic way,” says Anna Kahn, EY Global New Services Leader. “For those that are, there is no consistently applied guidance or operating procedures.” Also, be aware that giggers can gain valuable insights into your company during their work. “Organizations need to incorporate the policies and technology to reduce their governance, financial and reputational risk,” Steadman warns. Setting up robust legal protections like nondisclosure agreements is fundamental for any organization that is outsourcing work that gives a gigger intelligence into IP or commercially sensitive information. Applaud the benefits: “Currently the legal landscape is a hindrance to employers getting engaged with folks that want gigs, and giggers getting engaged with employers,” says Steadman. “The current legal landscape has many different hurdles, pitfalls and clauses that make it wrought with challenges.” To help reap the benefits, regulators should applaud the entrepreneurism of the gig economy – these self-starters created work for themselves, often during periods where the economy was in freefall or stagnation. Support individual giggers: Pay attention to the advocacy of the unions and freelancer associations who can draw attention to companies operating unethically in the gigger domain, such as through non-payments. Easing the process through which giggers can take such claims through the courts could help. Intervene appropriately: Where companies are exploiting giggers – such as through offering misleading income projections, or employing workers on what is effectively a full-time basis but avoiding tax contributions – regulators should get involved or risk giggers being put off participating in this new, growing economy. This failure to protect individuals could lead to stagnation and loss of the growth potential gigging can bring. We live in a world in flux. Technology has made our lives as consumers easier and has also made business operate more efficiently. It was only a matter of time before technology fundamentally altered the nature of work. The rise of the contingent workforce holds a wealth of opportunities for organizations and workers alike. Organizations want to cut costs and improve their agility to meet constantly changing consumer demands. Contingent workers crave flexibility and control. By working together and collaborating with government on ways to overcome the potential risks, organizations and giggers alike can ride a rising tide that will lift all boats to economic prosperity and performance. Giggers, organizations, and government can and must collaborate to find a way of working that is mutually beneficial.